Minutes before the start of the Formula 1 2018 Etihad Airways Abu Dhabi Grand Prix, race goers were thrilled by a spectacular Etihad Airways and Fursan Al Emarat fly past. 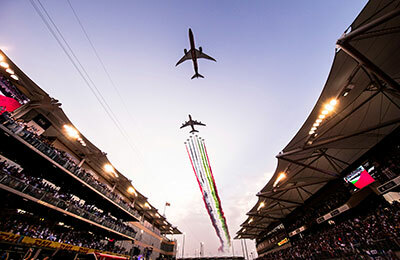 Etihad Airways’ all-new 10 Year Abu Dhabi Grand Prix Anniversary liveried Boeing 787-9 and Year of Zayed liveried Etihad Airways Airbus A380 led the aerial parade over Yas Marina Circuit’s start line at 16:57pm. A crowd of 60,000 witnessed the impressive display that saw Eithad Airways’ two aircraft and the seven fast jets of Fursan Al Emarat flying at 400km per hour at 800 feet above race goers just prior to the 10th edition of the Abu Dhabi Grand Prix.